Well it’s almost officially autumn, my favourite season of all. While I’m looking forward to chunky sweaters, hot mugs of steamy something or other, the fall harvest and all of it’s abundance, I can’t help but feel a bit panicked by how quickly time flies. Wasn’t it just January? Didn’t 2015 just start, and how is it coming “close” to an end already? I’ve realized just how behind I am on my course completion goals and last week I sat down to create an aggressive study plan that would allow me to catch up. I’m eye ball deep in Human Anatomy & Physiology and so fascinated by the inner workings of the human body. I’ve also jumped ahead and started my reading on the next course, Preventive Nutrition and I’m beyond enthralled. It may have taken me a while to uncover my passion and true calling, but I’m sure glad I’ve made it here. Better late than never right? I can’t wait to start applying this knowledge to help others achieve harmony and balance from the inside out. In the meantime, let’s talk peaches. I’ve been all over them this summer, mostly enjoying them in their natural state and while I still stand by my conviction that nothing beats a juicy and ripe Niagara peach, the Italian ones have served their purpose. I had this conversation with my friend Audrey on social media a few weeks back. While the general rule would be that Mediterranean produce is far more flavourful than what you would find in Canada, Ontario peaches seem to be the exception, in my opinion. Speaking of Audrey, you should head over to her blog as she’s posted a few peachy things herself lately and check out her database of other amazing recipes while you’re at it, just try not to lick the screen. 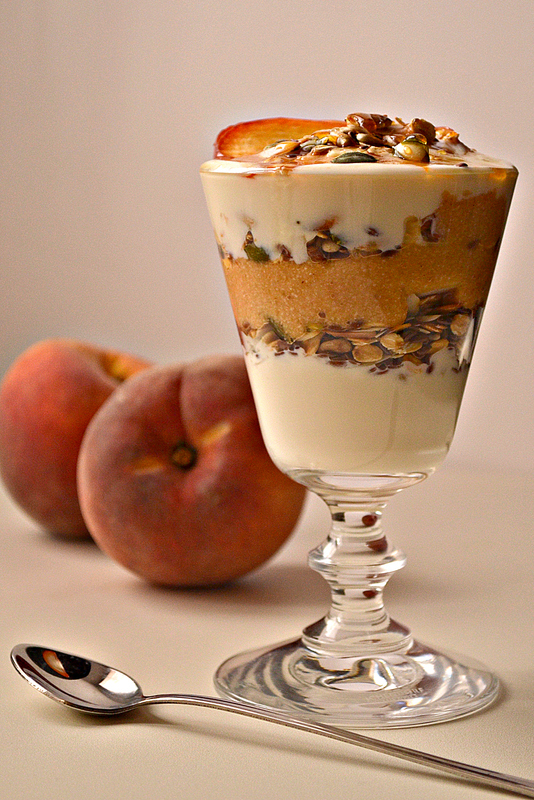 Before peach season makes a dash, I have to share this recipe with you for a Peaches n’ Cream Toasted Muesli Parfait. It takes minutes to whip up, especially if you already have a batch of my toasted muesli on hand and it makes an awesome weekday breakfast or in between meal snack. Assemble the parfait starting with a layer of yogurt followed by toasted muesli, peaches n’ cream puree, then more muesli. If your yogurt is unsweetened or if you generally like a sweeter flavour, mix brown rice malt syrup into your yogurt before you use it. For the final layer, top with yogurt and peaches n’ cream purée and swirl them together. 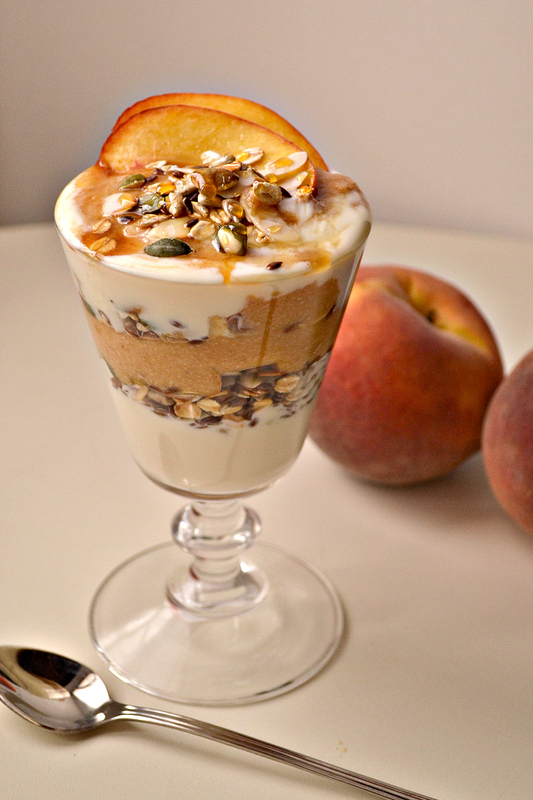 Top with peach slices, some toasted muesli and a drizzle of brown rice malt syrup. Add all ingredients to a blender or use a hand blender to puree to a smooth creamy consistency. Adjust brown rice syrup to your liking and based on how sweet your peach is. And yes, I truly believe nothing beats a Niagara peach. 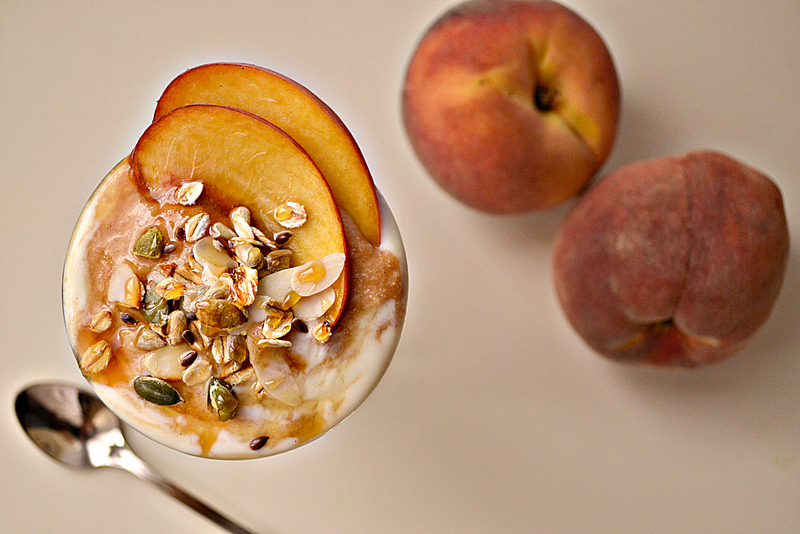 Except your beautiful photos of this peach muesli — somehow they make me feel like Italian peaches are pretty tasty too 😀 Your muesli peach parfait is positively golden! I may have asked you this before, but just curious why you prefer to use brown rice malt for sweetener? Is it the same as brown rice syrup? Audrey, thank you! Italian peaches are tasty too, but my heart belongs in Niagara when it comes to this fuzzy fruit. I’m not sure that there is a difference between rice syrup and rice malt. I believe they are the same. I do know that the ones I buy here in Italy are tastier with a slightly darker colourr vs what I used to get in Canada. Besides the great taste, brown rice malt/syrup is a complex carbohydrate and is made up mostly of glucose and maltose and doesn’t contain any fructose at all so it digests like a complex carb and it’s slow releasing unlike maple syrup or agave. Agave is 90% fructose and I tend to avoid it and maple syrup is 40% fructose but still one of my favourite sweeteners for the flavour it imparts and the fact that you need so little to get the sweetness results…and what’s life without maple syrup anyways, so I exert moderation. That’s great news Audrey, so glad you enjoyed it.